Temple 6 - #14 Notre Dame 28. Notre Dame welcomed the Temple Wet Owls to South Bend last week and won in marginally convincing fashion. Temple left 7 points on the field, missing two field goals and having an extra point blocked. Meanwhile, the Irish put up 14 points in the first five minutes of the game, and were only able to punch it in twice for the rest of the game. Worse still, those first two touchdown drives relied on huge plays (45, 32, 51, 32), of which the team only managed one more (a 66-yard pass for the team's third touchdown). Notre Dame's inability to put together sustained drives could have been anticipated after the loss of starting QB Everett Golson, but against a team like Temple, the offense should still be able to move the ball. The vaunted Irish defensive line failed to impress as they were expected to; the Owls managed 4.5 YPC on 29 rushes. ND did keep junior QB Connor Reilly to a 50% completion rate and only 5.0 YPA. Then again, this marked Reilly's first game action, so a rough outing was expected. 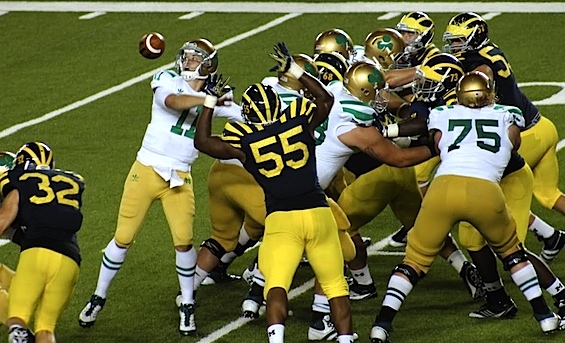 No matchup will be more important than how Michigan's offensive line manages Notre Dame's defensive front. 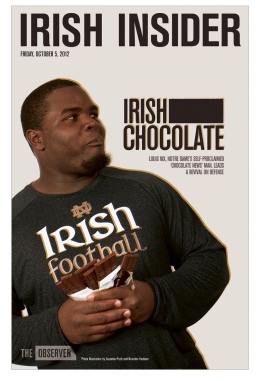 The names to know are Louis Nix III (aka Irish Chocolate, apparently) and Stephon Tuitt. Nix anchors the defense, acting as a black hole in the middle of the defensive line. At 350+ pounds, Nix presents problems for the inexperienced interior of the offensive line. MGoBlog postures that Michigan introduced the zone stretch into the offense in order to attack Notre Dame's defensive ends rather than trying to push Nix off the line. Flanking Nix at defensive end will be Tuitt, a havoc-sower for all teams that don't feature Taylor Lewan. Tuitt finished 2012 with a team-leading 12 sacks, and still stands at over 300 pounds, making him difficult to attack in the run game (unlike, say, Frank Clark). Michigan remains uniquely prepared to handle Tuitt with two senior offensive tackles, including the best left tackle in the country. The third lineman in Bob Diaco's 3-4 defense is sophomore Sheldon Day, a nondescript defensive end who should be a non-factor in this game. Notre Dame's only other defender of note is senior outside linebacker Prince Shembo, who finished the 2012 season with 7.5 sacks, 21 solo tackles, and 27 assists. Shembo is pitch perfect for Diaco's aggressive, blitzing defense, and will challenge Michigan's running backs to block him on blitzes (of which, Fitz Toussaint did poorly in week one). Concerns about moving the ball against Notre Dame have been tempered following a subpar performance against Temple. But as we've become all too aware, Notre Dame, Michigan State, and Ohio can look awful all season and still drag Michigan through the mud. Non-Gardner runs will be touch and go throughout the game. Nix and Tuitt are going to beat Michigan's offensive line a few times. Dispersing those negative plays across multiple drives and recovering quickly from them will be important if Michigan will produce multiple, sustained drives. Because Notre Dame's defense relies heavily on blitzes, Gardner's scrambling could pay dividends. His ability to get out of the pocket may slow the Irish front seven, allowing Michigan to run from their base offense more easily. In the secondary, Notre Dame is unexceptional. If nothing else, the Irish defensive backs have experience, boasting two seniors, a junior, and a sophomore. Most of the turnovers that the secondary produces are a function of Notre Dame's front seven getting pressure. Once again, blitz pickups from Michigan's backs will allow Garnder the space and time to find receivers downfield. As we've already seen this year, getting traffic in Gardner's face can end in turnovers. The man behind the curtain, as always, is Al Borges. Michigan's offense against Central Michigan was vanilla. During fall camp, we saw plenty of footage of Michigan running the inverted veer and other spread concepts which were largely absent in the opener. I fully expect Michigan's offense to have a little more pizzaz against Notre Dame. What that entails, I'm not sure, but a few more zone reads are likely, as are play action off of those. Good news everyone! Tommy Rees is back. In spite of his perpetual derpitude, Rees set his career record for passing yardage against Temple and has been serviceable+ against Michigan in his career. But on the quarterback fear index, Rees ranks just above a half-slurped Go-Gurt. With Everett Golson getting booted from the team, this season was always going to be a reclamation project on offense. But it might be worse than originally thought, in spite of a solid performance against Temple. Rees' long passes last week came on a wide-open post route with no safety help, a bubble screen, a wide-open corner route with no safety help, and a wide-open seam route to a rumbling tight end. He has not developed into junior Chad Henne. This is just Tommy Rees. Golson wasn't the only loss from last year's offense. Cierre Wood graduated and junior Theo Riddick entered the draft early, stripping Notre Dame of their top two rushers from a season ago. In week one, Notre Dame's running backs were not great. Nominal starter, junior George Atkinson, squeaked out only 34 yards on 8 carries--one of which was a 14-yarder. Junior Amir Carlisle had the highest YPC (68 yards on 8 carries; 9.7 YPC) but that number is bolstered by his 45-yarder that was handed to him after Temple's linebackers blitzed with no regard for running lanes. On the outsides, Notre Dame's wide receivers do not intimidate. Gone are the Michael Floyds and Golden Tates of recent years. TJ Jones returns for his senior year after averaging 13 yards per catch last year. Against Temple, Jones had six receptions for 138 yards. He is your prototypical slot receiver and will be the recipient of many screen passes. He has good speed and will need to be tackled in the open field often; how Courtney Avery and Thomas Gordon handle Jones could go a long way to determining how this game goes. But other than Jones, the Irish receivers do not intimidate. Michigan's ability to get pressure on passing downs with only four men against Central showed promise for this matchup. Notre Dame is going to spread the field on almost all downs, so to avoid big plays, Michigan will need safety valves for when man coverage invariable goes wrong. If Michigan's front four can generate a pass rush, that will help alleviate a lot of the stress on Michigan's safeties. How does Michigan win? Notre Dame's defense didn't overwhelm Temple, which bodes well for Michigan's chances. 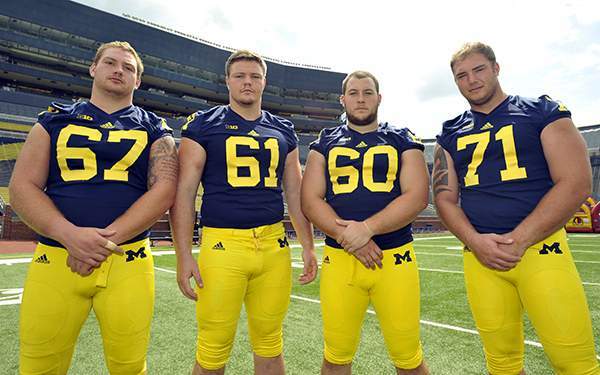 Michigan's offensive line looks improved from week one and the team averages 5.5 YPC. Notre Dame's blitzes are occasionally effective, but more often than not, Gardner is able to scramble out of danger and either pass or throw for significant yardage. Defensively, Michigan's front four completely dominates the Notre Dame offensive line and the Irish can never get their running game started. One or two big passing plays from Tommy Rees are all that keep Notre Dame alive, but Michigan dominates the game throughout. How does Notre Dame win? Nix and Tuitt look more like they did last year than in week one. Michigan's young offensive line struggles to block Notre Dame's pressure and the team averages only 3.8 YPC. The Irish blitzes also disrupt Garder who makes bad decisions and bad throws, tossing multiple interceptions. When Notre Dame has the ball, Michigan's young secondary struggles to contain Brian Kelly's spread attack and Tommy Rees avoids mistakes while throwing three touchdowns. Michigan's front four can't generate a pass rush and has to dedicate linebackers and safeties to the pass rush, opening things up on the back end. ada yang kemarin bersikeras tidak butuh. Pagi ini perasaan rindu mulai tumbuh.